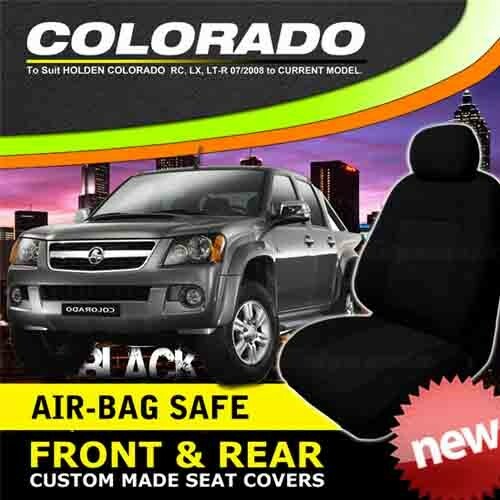 Holden Colorado RC Crew Cab BLACK Custom made Seat covers Front and rear. Home » Holden Colorado RC Crew Cab BLACK Custom made Seat covers Front and rear. In this set you will recieve Custom made seat covers for the front 2 bucket seats plus a full custom made rear seat which allows you to use ever factory feature in your seats.eg armrest, move your head rests. ( Every part of the seat is wrapped seperately). They come backed with a 2 YEAR warranty. WE ALSO SHIP 5 DAYS A WEEK.